A surprising, funny and even affecting entertainment industry satire, Citizen King makes the most of its meta references, and star-director Johnson Lee does well in both his roles. The rare Hong Kong indie that transcends, or at least sidesteps its obvious pretentiousness. by Kozo: Johnson Lee isn't a household name and Citizen King won't change that. However, it should hopefully give people a greater appreciation of his talents. A black-and-white Hong Kong indie written, starring and co-directed by Lee, Citizen King spotlights a struggling actor named Gum Kwok-Man (Lee), who goes by the self-aggrandizing English name "Citizen King". Citizen believes that the Hong Kong film industry doesn't value his dedication or talent, and is bitter at seeing no-talent performers getting all the breaks. His prickly, superior attitude doesn't help him much; he's fired from his latest job because he lectures everyone else on how to be a professional. Citizen King is now at the bottom of his profession, which is a ripe time for some reevaluation. That's just what happens to Citizen - that is, after he goes through an eye-opening personal ordeal that lays bare his possibly self-inflated ego. Thinking that Hong Kong is a dead end, Citizen schemes to become friendly with visiting Hollywood executive Larry Mills (Brian Burrell), hoping that the connection will grease the wheels for a Hollywood debut. Citizen's efforts don't go unrewarded; after wining and dining Larry (not to mention paying for some, uh, company for Larry), Citizen is offered a chance at a Hollywood audition if he can provide Larry with a demo reel in a few days. One requirement: he wants Citizen to perform some martial arts. Citizen is not a martial arts expert, so he hires out-of-work action director Master Cheung (Gordon Liu) to choreograph his demo reel. Their negotiation is satirical but believable, with Master Cheung feigning a packed schedule and numerous responsibilities in order to up his asking price. Citizen gives him face and agrees, but unfortunately he doesn't have the money. Luckily, Citizen is offered a loan by Annie (Farini Chang), a chance romantic interest who also claims to be Citizen's biggest fan. Will Citizen take the loan to fund his demo reel, or will his pride prevent him from accepting help from an admiring fan? 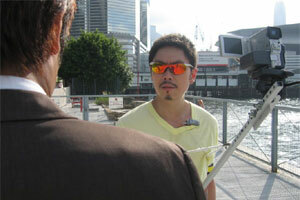 Will Larry Mills take Citizen to Hollywood to be the next Russell Wong? And will Citizen ever realize that he's not that great an actor? To answer that last question would be difficult, but based on his demo reel, probably not. Citizen King's demo reel is a hilarious parody of cheesy chopsocky that's revealed to the audience during a tense scene where Citizen is unfortunately on the verge of self-destruction. Citizen King goes for a knowing riff on Martin Scorcese's King of Comedy, and the varying tones employed by Lee and co-director Ching Long prove both harrowing and darkly funny. While ultimately minor, Citizen King is a smart and confident satire on the entertainment industry with well-defined situations, solid direction and a strong leading performance from Lee. Brian Burrell is fun and appropriately unconvincing as the shifty Larry Mills and Farini Chang lends a warm presence as the love interest. Also of note is Gordon Liu's performance, made especially delightful thanks to its self-referential humor. There's some obvious self-promotion here, as Citizen King basically announces Johnson Lee to be an unheard of multi-hyphenate talent. Still, the film satirizes that self-aggrandizement; Citizen King is so sold on his abilities that he'll Photoshop himself onto Hollywood movie posters, proclaim himself to be a "master of accents", and even do hammy impressions of Robert DeNiro and Al Pacino. Lee plays a guy who thinks he's a better actor than he really is, and he does it so well that it's easy to believe that he really is a good actor. The whole thing is so meta that it threatens to give the audience a headache, but it's all good. Maybe Lee is trying to have his cake and eat it too, but Citizen King engenders enough goodwill to allow Lee some self-congratulation.